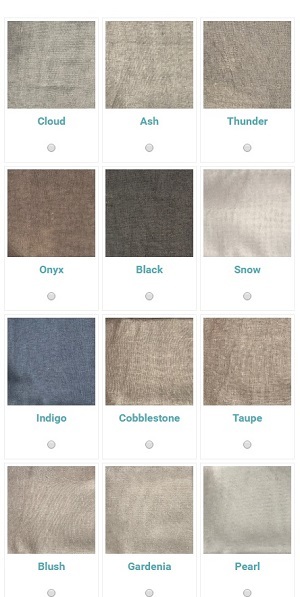 Choose the 'Luxe' or 'Linen' look. Keeping it simple, iseekblinds has selected 5 of the most popular sheer ranges. These ranges offer numerous options to deliver the look you see in high-end decorator magazines at a fraction of the price! Now everyone can showcase beautiful decorative sheers in their homes. All of our curtains are custom made to your exact specifications and come complete with S-Fold tracks. 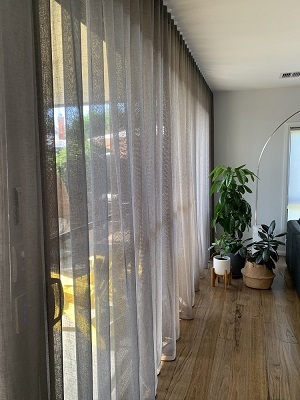 We use a 75mm S-Fold heading tape to ensure the curtain is well structured, delivering a gentle S-shaped curve that holds its form all the way from the top to the bottom of the curtain. Your sheers will hang beautifully for an outstanding result. Our sheers are made to 100% fullness, meaning that the fabric width is 2 x the length of the track giving volume and depth to the fabric when hung. Pair with blockout Roller blinds to soften the overall look of your interiors whilst ensuring the light control you are after. Or pair with a Blockout or Room Darkening fabric in a double curtain format. 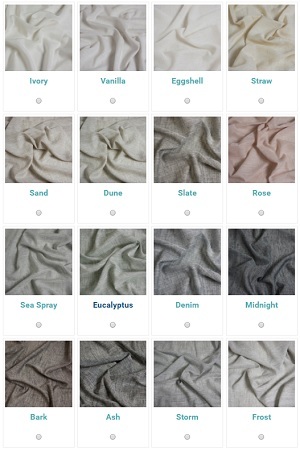 Michael takes you through the range of Sheer Curtain fabrics available on the iseekblinds website - Select a popular 'Linen look' sheer from the Chios or Bali ranges, go for a soft and floaty look with Kasos, or select our new 'Luxe' fabric in the Supremo range. Numerous colours are available. Fabrics by Warwick Fabrics, Nettex & Filigree. A beautiful sheer offering a modern linen look, Bali is effortlessly elegant. Bali's voile like texture will add a gentle, soft floatiness to any room. With an extensive colour palette, Bali's max drop of 3200 mm is perfect for curtains requiring a longer drop. 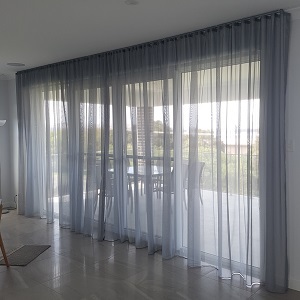 All of our curtains are made in a continuous fashion, meaning the curtain is made out of the one piece of material so no joins or panels, for superb drape-ability. Colour fade resistant, Bali has a self-weighted hem for an all round stunning result. A brand new release from Warwick Fabrics, Sardinia is the latest collection replacing the much loved Chios range. Light and airy, Sardinia's open weave construction offers a tactile finish and textured handle that replicates the feel and composition of a natural weave. Woven with two yarn colours to offer all the advantages of a two-toned linen look Sardinia provides great versatility when it comes to matching colours and textures for your interiors as well as creating a lovely interest to the fabric when it is hanging. 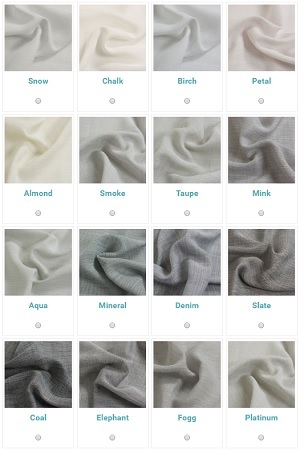 A great value alternative to expensive linen sheers. Featuring a sophisticated palette of 17 stunning colours to choose from Petal, Aqua and Mineral are examples of soft pastels that are gentle, sophisticated and relaxed. Whilst Chalk, Birch and Platinum offer a timeless aesthetic with neutral hues that will feel at home in both traditional and contemporary interiors. Catering for longer drops up to 3100mm, with a self-weighted hem and an S-Fold track, the overall look is simply stunning! Another brand new release from Warwick Fabrics, Burano is a sheer of perfection! Composed of 50% natural linen at an affordable price point, Burano features a two-tone yarn dyed weave and lightweight handle creating a sheer of sophisticated ambience with an effortless drape. The linen adds a tactile texture and a lovely organic feel that results in a beautifully soft finish. The two-tone weave allows you greater flexibility when coordinating your sheer curtains to blend into existing interiors with ease. Featuring a self-weighted hem and drops up to 3050mm, Burano is ideal for wide spaces and high ceilings delivering an overall aesthetic that is luxurious yet relaxed. An extensive palette of 16 colours including timeless neutrals such as Sand, Ash and Storm guaranteed to cater for every colour scheme, across light and subtle hues to dark and moody shades as well as soft colour offerings such as Rose and Seaspray adding romantic sophisticated calm. Back by popular demand! With its sheer cotton muslin look and organic feel, Kasos hangs beautifully adding a light and floaty softness to any room. 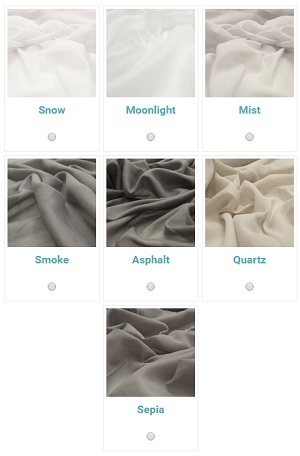 Kasos offers a neutral fabric with a lovely plain design. With a compact palette offering the 7 top-selling colours, Kasos can easily be incorporated into any interior theme. Supremo, composed of a lightweight sheer fabric ensures an elegant finish. Featuring a plain weave design in a multitude of colours and balanced by an inherent softness and gentle float, Supremo offers a cost-effective luxury solution with modern appeal. Enabling longer drops of up to 3200 mm in a durable polyester, Supremo is ideal for high ceilings with a conveniently weighted hem delivering an effortless drop and superb drape-ability. Supremo will instantly modernise any room and add a serene sense of luxury to your home.